If you are a resident living in the beautiful town of Horsham, you may feel at a loss when it comes to finding a party bus to hire. Then look no further than Star Limousines. The company can offer a wide variety of services for different occasions be it stag parties, hen parties, weddings among many other events. The party is self-contained within the party bus and you are able to just have fun without having to go out of the bus itself hence; making it definitely worth trying out. Why Choose To Hire A Party Bus From Star Limousines? 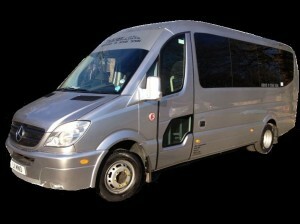 Basically, we are able to provide the party bus as a nightclub within the confines of a bus. The music is epic as you can choose your own. In addition, you are offered a complementary drink and the bus is fitted with a complementary bar hence, making the experience even more memorable! Other features also include the 40-inch colour TV’s which are able to present the music being played hence; improving the aesthetic beauty of the party bus. This is also accompanied with neon lights which highlight the hired party bus and bring out the night-life from it. This makes a great background to take photos in. 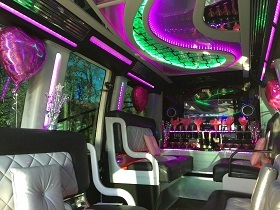 The hired party bus also comes with fibre optics, colour changing wall as well as a colour changing dance floor which work and coordinate together to create a very beautiful ambiance in the party bus. In addition, the colour changing dance floor and walls are able to operate in conjunction with the music being played. For all music lover and singers, there is a karaoke machine inside the hired party bus and friends can sing their hearts out happily to whichever song they wish to sing. The lyrics are easily displayed on the 40-inch colour TV’s fitted in the party bus hence; one can easily sing along from any angle in the bus. There are two types of party buses that can offer these services and one of them has amazing graphics on the outside hence will easily attract attention wherever you go. The buses are all well-equipped with all the features mentioned above and the services offered are nothing but the best.